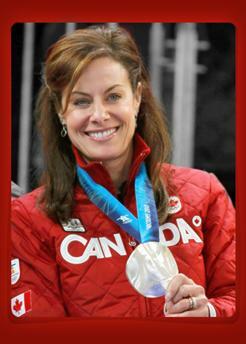 Cheryl Bernard is best known for her long list of curling accomplishments and awards. She is a two time Olympian (2018 & 2010) a 2009 Canadian Olympic Trial gold medalist and 2010 Olympic silver medalist, she is also a four time Alberta women’s champion, Canadian Runner-up, TSN Skins finalist and has maintained a top 5 status on the World Curling Tour for many years. Curling has not always been at the top of her “to do” list, Cheryl is a dynamic, results-oriented leader with a strong track record of team building performance improvement in both the corporate, not for profit and sporting world. Strategy, vision and the ability to identify, connect, engage and deliver to create awareness has been key to her success. At the age of 23 she started her own general insurance brokerage in Calgary. And by creating a dynamic agency culture that empowers, she and her staff propelled the agency to 7 Million in sales in 12 years. At that time Cheryl decided it was time to re-focus on curling, writing and fundraising – so she sold her agency to Western Union Insurance. Six months after Cheryl sold, her father was diagnosed with a brain tumor and was given 6 months to live. Cheryl was lucky to be able to devote most of her time to caring for her father and trying to find a cure. Sadly he passed away 2 years later. However, her father’s illness was the catalyst for her to create the annual “Curl for a Cure” in support of the Canadian Breast Cancer Foundation. In the five years that this event ran (from 2003 to 2007) over 1.3 million dollars was raised in support of the CBCF. Cheryl co-authored and published “Between the Sheets Creating Curling Champions” in 2005. Which describes the mental side of the game of curling. She added a final section to the book titled “The Silver Lining” which was released Feb 2011. Cheryl retired from competitive curling in 2014 and was hired by TSN as a broadcast analyst and since then has split her time between that and corporate speaking. Cheryl is an engaging and experienced speaker who has the ability to deliver thoughtful and impactful keynotes that can influence and raise enthusiasm. During all these stages of her life Cheryl has never lost site of the need to give back. She has volunteered on a variety of boards, as well for the Canadian Curling Association and the World Curling Tour. She was the spokesperson for the 2010 Terry Fox Run and has done promotional work for the Alberta Children’s Hospital, Children’s Miracle Network and Dairy Queen Miracle Treat Day. She is currently devotes much of her energy to Goodwill Industries of Alberta as their spokesperson & ambassador. Cheryl also gives her time to WorldVision as one of their celebrity ambassadors. Cheryl is also an avid traveler and enjoys spending her free time traveling and golfing with her common-law husband, Terry Meek.